August 17, 1925. "Students of George Washington University in brain test." National Photo Company Collection glass negative. View full size. Submitted by Dale Neiburg on Fri, 07/02/2010 - 12:45pm. 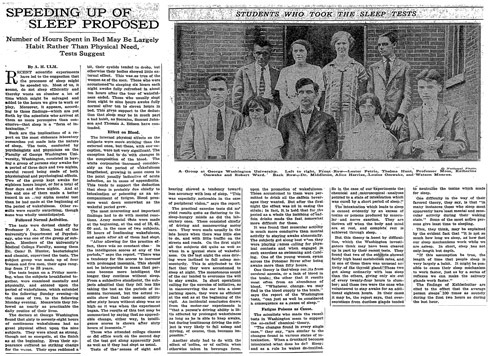 According to the article, "Professor Moss" (front center) devised the sleep deprivation experiments but was then one of the subjects in the test himself. Their finding: Sleep is the result of "intoxication ... caused evidently by an excess of toxins or poisons produced by muscular and nerve exertion," much like a "drunkard" falling asleep and waking up sober. The ones I'm curious about are the woman second from right in the front row, identified as Katherine Omwake and the woman second from right in the back row, identified as Louise Omwake. Sisters? Submitted by Anonymous Tipster on Mon, 03/03/2008 - 11:36pm. You say nerds, I say they look smart and interesting. Submitted by Ignaz on Mon, 03/03/2008 - 5:56pm. Yep, me can hardly solve the math question at the bottom. So give us more Kaa-Razy Kat Club stuff. Submitted by jsmakbkr on Sun, 03/02/2008 - 1:40pm. 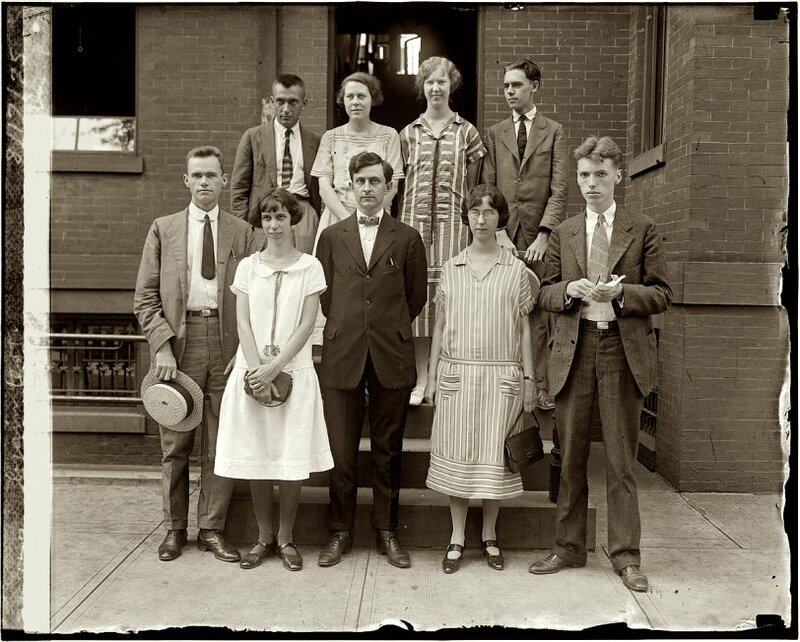 GWU did a nationally-publicized study released in 1925 on how much sleep the brain really needs, and I'd bet that this photo is of the professor (front and center) and grad students who made up that team. The best free clue comes from the nyt.com preview of a December 13, 1925 New York Times article on the study, which includes these lines: "A Group at George Washington University. Left to right, Front Row -- Lester Petric, Thelma Hunt, Professor Moss, Katherine Omwake and Robert Ward. ... "
Submitted by Guido Merkens on Sat, 03/01/2008 - 2:22pm. was that term part of the lingo in 1925? Submitted by Hugoton Horatio on Sat, 03/01/2008 - 2:07pm. None of them look like they fell off the turnip truck. Just imagine, they were probably the scientists who helped save this nation while working at facilities such as Los Alamos during WWII. Submitted by Mr Mel on Sat, 03/01/2008 - 1:57pm. Just what are they testing for, intelligence or defects? Submitted by Anonymous Tipster on Sat, 03/01/2008 - 10:22am. A nerdier looking group is difficult to imagine. Submitted by Anonymous Tipster on Sat, 03/01/2008 - 8:33am. Isn't it interesting how these college kids look so much older than ones today or even a couple of decades ago. I wonder what their actual ages are! Submitted by Ron on Sat, 03/01/2008 - 6:21am. The pens in the pockets of the two guys up front makes me wonder if they were called nerds and I bet they never went to the Krazy Kat Club.